Facom Extra Long Combination Wrench-36mm - there are several photos with additional details (click to enlarge). 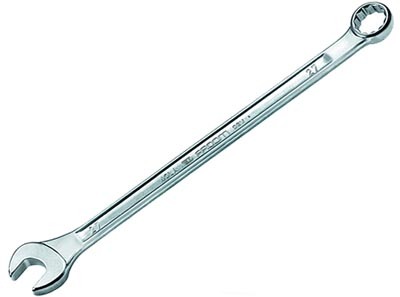 Facom currently offers a standard and extra long version of their non-ratcheting combination wrench....the 440 series (standard length) and 40LA series (extra long). The previous 40L (high torque series) was discontinued years ago and replaced by the 40LA. I still have some of the older 40L's in stock. As of 2018, Facom has discontinued the fractional sizes (there are still some in stock). Alternately, many of the metric sizes are identical in dimension and weight to the previous fractional sizes other than the markings on the wrench (see 2nd table photo for crossover of sizes). This wrench is identical to a 40.7/8LA.